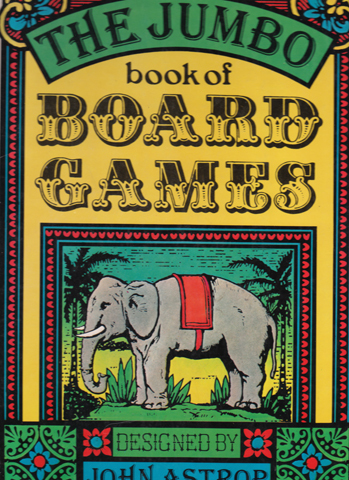 Description: This rare and unusual book features 16 printed boards – virtually all of which are double-spread – for various games on its extra-large pages. Most of these are old favourites like Chess, Backgammon, Ludo, Steeplechase, and Merels (also known as Nine Men's Morris), but there are also some lesser known games, such as Shunting, Dragon, Warlord, Spychase, Five Field Kono, and Asalto. Also features a humorous take on Snakes and Ladders called "Fire! Fire!" in which the snakes have been replaced by hosepipes. All boards are in glorious full colour, with exception to those for chess/draughts and backgammon – located on the front and rear pastedowns and endpapers. Rear cover features an additional board for Merels. Glazed pictorial boards are lightly scratched (visible only under direct light). Negligible wear to spine and corners; both are largely straight. Internally, the book is effectively as new. The glossy pages are in superb condition: bright, unmarked, and free from foxing. There is, however, some very light tanning in the gutter, and a small mark in blue ballpoint on the flyleaf. Measures 36 cm × 25 cm (14.4″ × 10″). Large Folio. Unpaginated.